The Japanese government has been preparing to make revisions to the Basic Energy Plan which was approved in 2014, after the Fukushima Daiichi Nuclear Power Plant accident. The Basic Energy Plan indicates medium to long-term policy guidelines for the next ten to twenty years, with revisions every three to four years, and there is significant interest in how the revisions will position nuclear and renewable energy. 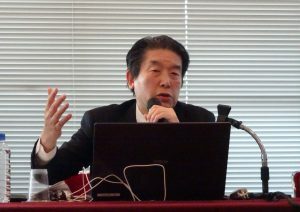 The FPCJ invited Dr. Takeo Kikkawa, a professor at the Tokyo University of Science and expert in the energy industry who is also a member of a government panel of experts, to speak about revising the Basic Energy Plan. The briefing had a total of 34 participants, including 18 journalists from China, France, Germany, U.S.A. and Vietnam, etc and 19 embassy representatives.